1/12th scale. Classic Pub Food ! , , A mouthwatering Ploughman's Lunch for you to include in your miniature Pub setting. 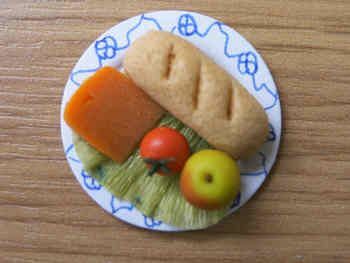 , , Including a large chunk of cheese, a bread baguette, lettuce, tomato, and apple, and presented on our hand-decorated card plate. , It is a choice which is listed on our M28 Pub Menu.